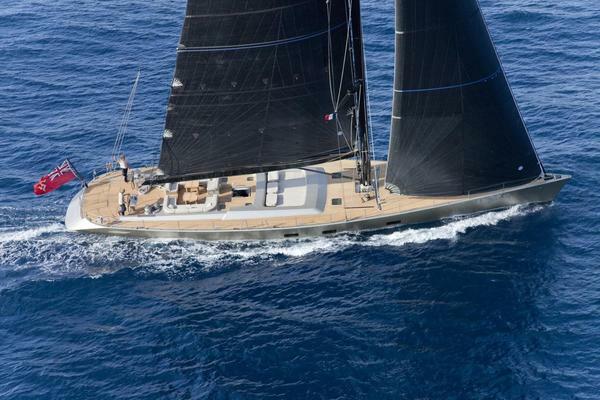 NOMAD IV is a fabulous sailing yacht that functions superbly for either racing or cruising. She is built entirely out of carbon by the famous architects, Finot Conq. NOMAD IV is an 100 ft extrapolation from the Vendée Globe Open60, or from the Volvo Race, and she took the gold medal for the RORC Transatlantic 2015. For cruising, she is particularly comfortable thanks to her enormous length and her equally large interior and exterior spaces. Her large garage equipped with an abundance of toys ensures that each guest will find an activity they enjoy! Her large cockpit with 2 tables each capable of seating up to 12 guests is ideal for relaxed dinners on board, and the ample sunbathing space permit guests to soak up the rays in total comfort. Her deck saloon has stunning 360° panoramic views. NOMAD IV accommodates 12 guests sleeping on board in one master cabin, 2 guest cabins with double beds, one cabin with twin beds (bunk beds) and one quadruple cabin with a large double bed and 2 twin beds (bunk beds). Each cabin has an ensuite bathroom. While NOMAD IV is unquestionably a performance yacht with state of the art technology (such as a carbon mast and 3DI sails) capable of delighting even the most experienced yachtsmen at the helm, her lateral ballasts guarantee that you can sail her almost flat. Her adjustable keel allows you to sail easily into ports and to access the most beautiful creeks and coves imaginable. United Yacht Sales New Jersey would love to guide you through a personal showing of this 101' Maxi Dolphin Finot Conq 3 2013. This yacht for sale is located in Unknown France and priced at $5,900,000. For a showing please contact us by filling out the form on this page and we will get back to you shortly!